The concept of prices ending in .99 is a marketing strategy. For years, .99 at the end of a price was a sign of a sale or good deal. There is also a psychological effect involved - it's a little magical phenomenon when a person associates $19.99 as $19 as opposed to $20.00. Don't believe me? Is there any chance you recall how much you paid, per gallon, the last time you filled up your gas tank? Of course, it depends on where you're living (what grade of gas you buy and where you buy it), but let's keep it simple and say the regular unleaded gas, at your local gas station, was $3.97. Ahhhhh... not so fast! You (likely) forgot the 9/10ths of a cent next to the price. Yes, my friends - you didn't really pay $3.97. You paid $3.97 and 9/10ths of a cent, which is practically $3.98. However, all we see is the $3.97. But I'm not here to talk about prices or gas. I'm here to share with you all that I've finally reached that wonderful moment when the scale went from the 200's to the 100's. I'm not happy I weigh 199(.4) - I'm ECSTATIC! 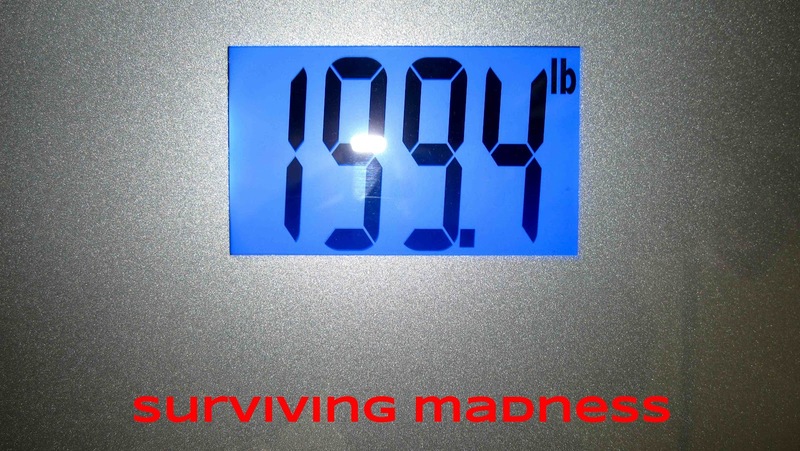 I've worked my way from 276 pounds on February 4, 2012 to 199.4 pounds as of September 8, 2012. That is 76.6 pounds I'm saying goodbye to forever, God willing! Those pounds aren't technically "lost" because I truly have no intention on finding them, EVER again! How did I do it? I know everyone secretly wants to hear, "I took this magical little pill, ate like an animal, never exercised a minute and just lost weight." Sorry folks - there is no easy way out when it comes to weight loss. My answer will continue to be - HARD WORK and RESOLVE (in the form of a balanced, portion controlled diet and exercise). I'm not done with my weight loss journey... however, I'm relishing this moment and am truly proud of how far I have come. When I started I couldn't recognize my own self and now I've rediscovered some of my lost happiness. I couldn't even run to the end of the block without feeling like I would keel over and die and now I can run 9+ miles! The last two days I've seen a few friends I haven't seen in months to as much as a year... they were all so amazed and proud of me. It brings me to tears as I think about it right now - because what all my friends saw was more than just the physical weight loss - they saw the pure joy in my face and my spirit. I am not the same person physically or mentally! Losing weight is more than the numbers on the scale - it really does have an impact on your health and wellness! However, with that said - I am going to celebrate my numerical accomplishment. The number 9 is my new best friend! When you're over 200 pounds - hitting 199 is a breath of fresh air (just as 299 is to someone over 300 pounds). Even if you don't have a significant amount of weight to lose, the number 9 is still magical! Going from 160 to 159 or 130 to 129 -- it's a wonderful feeling and sense of accomplishment to be in a whole new weight bracket.